“I&D Supervisor” – This is an industry term with which I struggle, as I’m sure many others do, including our clients. It’s standard practice for us to send an I&D Supervisor to large shows. Based on our experiences, we feel they are vital to the success of the installation and dismantle process, yet it is hard to verbalize their importance and responsibilities while on the show floor. We know when an I&D Supervisor is present, the installation process runs smoothly, clients are happy and the show is a success. During a recent meeting, our owner, Ted, made the perfect comparison: You wouldn’t build a house without hiring a General Contractor. The role of the General Contractor when building a house is the same as an I&D Supervisor: organize, prioritize, maintain schedules and be mindful of budgets. Let’s first make the distinction between General Labor, Lead and I&D Supervisor. These roles are not one in the same, yet many people believe they can be. Your General Laborers are the ones doing the grunt work – pulling parts, building, polishing metal, steaming graphics. The Lead oversees the General Laborers. Sometimes they oversee various teams of laborers at the same show where they have multiple booths being set. The lead typically floats between booths and labor teams to make sure everyone is working diligently and addressing any questions or concerns. Your I&D Supervisor is dedicated to your booth and will keep the entire booth build moving forward. They are experienced problem solvers and “big picture” thinkers – providing peace of mind, knowledge of industry standards and local union regulations. They have often performed the work of your other subcontractors. If there is a problem, it’s up to the supervisor to fix it, as they are responsible for the quality of the work that they oversee. 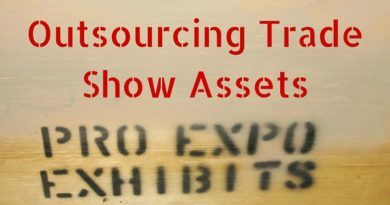 Often, an exhibitor will have flooring contractors, electricians, AV teams, rigging teams, and many others, in addition to the laborers who actually set the booth. That’s a lot of people. The I&D Supervisor helps coordinate all of these subcontractors so that one is not working on top of the other. They are the most knowledgeable about what needs to get done when so that the build can continue moving forward in a productive manner. As with building a house, you can’t install floors before the foundation is laid. Appliances can’t be installed before the floors are finished. The last thing you want is all of those subcontractors showing up to do work, then standing around waiting for one group to finish their task before the next group can start theirs. All on the clock and on your dollar. On the show floor, the I&D Supervisor ensures that electric, internet, and flooring are all installed in correctly before the booth build begins. They are on site to get the rigging moved up when the build runs ahead of schedule, or push back the AV call when it runs behind. 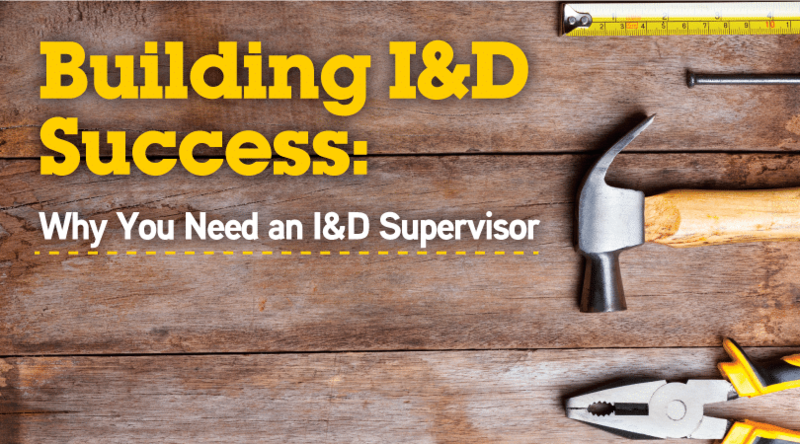 Being an I&D Supervisor is much more than keeping a watchful eye on your subcontractors. It’s staying one step ahead, keeping an eye on the clock, changing orders on site – all to eliminate potential chaos and additional on-site charges. An I&D Supervisor will often have an existing relationship with your labor crew, local union groups and other subcontractors. They make it a point to establish these working relationships in show halls and convention centers all across the country. Having an existing relationship with fellow workers on the show floor can go a long way. Many of you might be thinking, “well, that doesn’t sound all that complicated. I can fly in early to be in charge of all that.” One of the most important skills for any do-it yourselfer is to know when to call in a professional. When you have a really big project that involves skills outside of your knowledge and comfort level, turning to a professional is the way to go. Building a house – and a booth – can be a complicated and time consuming project. Is that where your time and skills will be put to the best use? Will you be prepared to handle a situation if something goes wrong? Next time you find yourself contemplating the importance of including an I&D Supervisor in your booth build, leave it to the professionals. Let us do the hard work while you sit back and wait for the show to begin. You’ll thank us later!